Get rid of unwanted stretch marks and feel confident in your skin. You don’t have to live with it, you can fix it! 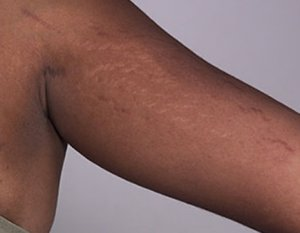 Stretch marks aren’t painful or harmful, but some people feel distressed about the way they make their skin look and laser stretch marks removal is a solution for this skin issue. It is estimated that stretch marks occur in 90% of pregnant women, 70% of teens and 40% of athletes. The stretch marks appear around the abdomen, hips and thighs, upper arms and breasts. They develop when the skin is stretched suddenly and the middle layer of your skin (the dermis) breaks in places, allowing the deeper layers to show through. In pregnancy this happens when your body grows faster than your skin can keep up with. Stretch marks appearance is different on every person. They can vary according to your age, skin type, their cause and since how long you’ve had them. The fast stretching of the skin causes stretch marks. Their severity is affected by several factors, including your genetic tendency, degree of stress on the skin and cortisone level, which weakens elastin fibers in the skin. The modern day technologies for Stretch Marks Removal make any woman’s dreams a near reality. Besides retexturing the stretch marks, these treatment also enhances production of collagen and elastin, thereby improving skin elasticity. The outcome and the time required for stretch marks complete reduction may vary from person to person, depending on the size, depth and age of the stretch marks. These are are very advanced treatment so it is important to note that such techniques should be undertaken only by trained Laser Specialists holding a valid license to offer you the guaranteed results. These two technologies are a very advanced treatments for stretch marks reduction & the results are visible after the first session. This cutting edge treatment for stretch marks reduction combines two techniques: PRP (Platelet-Rich-Plasma) and Micro-Needling. The PRP is first smeared on the targeted areas, and then a micro-pen containing vibrating needles at the tip is used to create small channels in the skin so the stem cells can be absorbed. Five to seven sessions are required to obtain good results. Click on the image for full story.